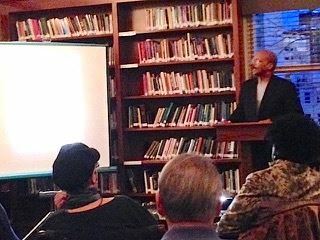 If anyone who attended the lecture on the pre-Civil War “Underground Railroad” arrived with the impression that it was indeed a “railroad” they soon were disabused of that idea and learned that the “conductors” led runaway slaves to freedom in the North by many different conveyances and routes but certainly not railroads. Noted historian C.R. Gibbs delivered the lecture to 17 Villagers on March 12. Many of them passed close to where we currently live on their perilous escape since “conductors” made use of canal boats on the C&O Canal starting in Georgetown and safe houses which included churches such as one in our own neighborhood (the 19th Street Baptist Church – originally at 19th and I Streets, NW) as well as private homes. The most telling stories of the horrors of slavery, however, were highlighted by the copies of notices of rewards offered to bounty hunters for return of runaway slaves posted by their masters. The notices included descriptions of male and female slaves of every age who were willing to face unknown perils and possible capture and retribution at the hands of their owners for an opportunity to gain their freedom. The wording of the notices also provided surprising insights into the slave owners themselves ranging from those who appeared to be surprised that their slaves would want to leave (!) to those who were so outraged that you knew that if the slave had been captured and returned that the consequences were horrific. The lecture was yet another reminder of how strong is the human instinct for freedom.